This detail shows how beautifully glazes have subdued the leaves in the background. First glaze was of Olive Green, then with a thin mixture of Prussian Blue (after the green dried). 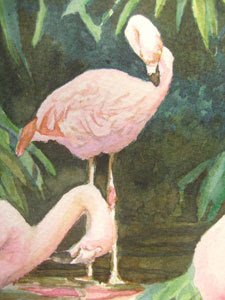 I have created recognizable suggestions of the plants behind the birds, without completely decribing them for the viewer. I used some Indigo to further push back the details here and there. 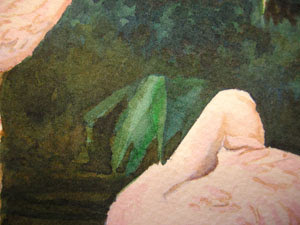 I also used Indigo in the beaks of the birds, and some of the darkest shadow areas along the shoreline.